The standard 3-prong receptacle is called a grounding receptacle because it allows a grounding wire to be connected from the electrical circuit to the appliance. 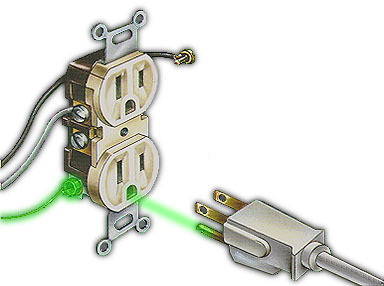 The grounding wire is connected to the third prong of the plug. When a 3-prong plug is plugged into the receptacle, the grounding wire is connected to the prong and provides a continuous grounding path from the appliance back to the breaker box. This grounding path serves as a primary safety means if there is a short circuit or other damage to the electrical circuit or appliance. The grounding wire in the circuit and on the appliance or tool is not required to make the appliance work.